On July 9 Project Reach, the Worcester Polytechnic Institute's year-long program promoting science for middle school girls, held its closing event. Girls from Worcester and surrounding towns had designed projects involving science and technology. 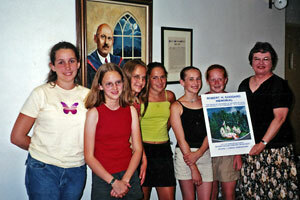 The Goddard team used computers to create visuals which could be used by the Goddard Association for fundraising. Goddard team members were Erin Dagle, Erin Day, Elizabeth LeBlanc, Stephanie McPherson, Jessie Miller, Fatima Mohammed, Alicia Petter, Jill Marie Powers, Carolyn Purington and Any Treen. The Team Facilitator, Gail Martineffi, and Team Assistants, Jessica Leuenberger and Zana Previti completed the team. The Goddard Association received the Project with thanks to the team for a job well done and hopes the participants' interest in science will continue to flourish.